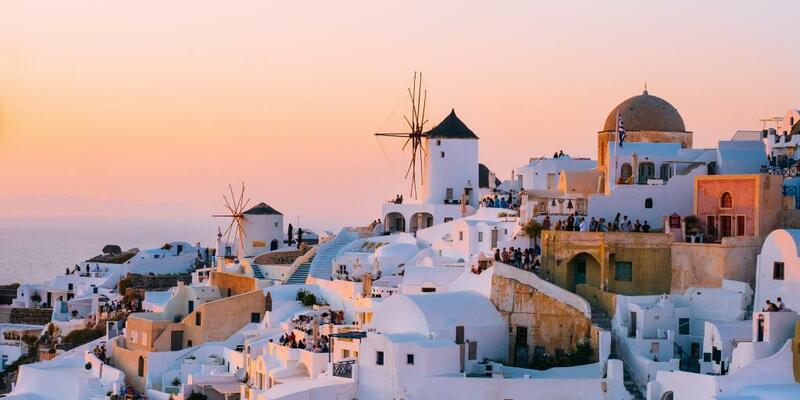 Nothing says romance like a honeymoon in Santorini, Greece, the island of pristine white smooth-edged houses, fiery orange sunsets and impossibly blue sea views. There are luxury villas and hotels galore here, many of which have honeymoon suites with private pools or Jacuzzis. The weather in Santorini is mild and pleasant pretty much year-round, and - best of all - there's very little to do apart from lounge around, drink wine, go swimming and enjoy the spectacular views. Now that the stress of wedding planning is over, what more could you want? Here's how to spend 8 amazing days in Santorini on the romantic getaway of a lifetime - and you can scroll down to the end of the article for hotel and honeymoon villa recommendations. Fly into Santorini Thira Airport, which is situated in Kamari on the east side of the crescent-shaped island. It's about 6km from the centre of Thira (aka Fira) city, and you'll easily be able to find buses, taxis, car hire companies and hotel shuttles from the airport to lots of the hotels and villas. Our advice? Treat yourself to a rental car so you can explore the island at your own pace. Make sure to choose a compact model to navigate those narrow streets! Most of the top hotels and villas in Santorini are on the west coast, with views of the sea - or the caldera, as it's known around here. What is a caldera, you ask? It's actually the remnants of a volcanic crater, which - in the case of the Santorini caldera - has largely been submerged in water. Take a bird's eye look at the Santorini island group and you'll see how it forms a circle, just like the mouth of a volcano. But don't worry - it's not due to erupt again any time soon! Head to your hotel, change into something a little more comfortable and take it easy for the rest of the day. There's plenty of time later on in the week for action and activities. For now, just breathe in the salty air and take in the ridiculously beautiful views. Even after you've been here a few days, these views will not get old! When you start feeling hungry, start your honeymoon off right with a luxurious rooftop dinner overlooking the cobalt blue sea. The iconic Ambrosia Restaurant is located in Oia, one of the most photographed villages on the island, known for its white-washed houses and sleek blue-domed churches. Ambrosia is the very definition of romance, with candlelit tables, sensational food and unbelievable views. Book a table well in advance to ensure your first night is as memorable as possible. Wake up late and lounge around in your room before making any moves. Why not treat yourselves to breakfast in bed, or step outside to eat it in the morning sun? This is your honeymoon, after all; if there's any time in life to be lazy and self-indulgent, this is it! Don't expect pristine white beaches in Santorini; with landscape this wild and dramatic, it's only fitting that the shorelines are just as colourful and eclectic. Once you're ready to brave the day, put on your swimsuits and head to Kamari, back towards the airport. Kamari Beach is covered in black sand and pebbles, making for quite the striking contrast against the clear blue water. Kamari tends to be less crowded than the better known Red Beach, but it's not completely deserted. You can rent a sunbed at an hourly rate or order food at a restaurant to have one of theirs for free. Relax in the sunshine, do some swimming, and pop into one of the seafood restaurants nearby for a bite to eat when you're feeling peckish. If you're up for it, there are also plenty of water sports you can try out here, from snorkelling and scuba diving to stand-up paddleboarding. When you've had enough of the sun, head back to your room and freshen up before dinner. In terms of cuisine, Santorini specialises in fresh seafood, of course, but there are a few other local delicacies you should try - namely fava (split pea puree), Ntomatokeftedes (tomato fritters), capers and the freshest, most delicious Greek salads you'll ever have. Seek out a restaurant with some of these dishes on the menu, and you're in for a fabulous night. Oh - and don't forget to wash it all down with Assyrtiko, the local Santorini wine. By now you should be well and truly in holiday mode. Take it a step further by enjoying a leisurely breakfast at your hotel and going for a morning dip in the pool. There's no need to rush anywhere today, so take it easy and read a book for the better part of the morning. 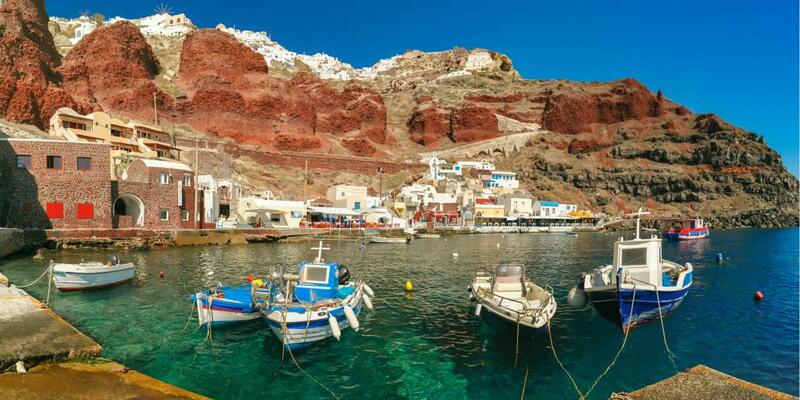 Around midday, make your way to Oia and head downhill from there to Amoudi Bay, a beautiful little inlet surrounded by high volcanic cliffs. It takes a little while to descend the 200 steps from Oia town down to the waterfront - so much so, in fact, that some people choose to do the trip via donkey ride - but trust us, it's worth it. (We recommend skipping the donkey ride. These tired animals look as though they've had enough of carrying people up and down all day long). 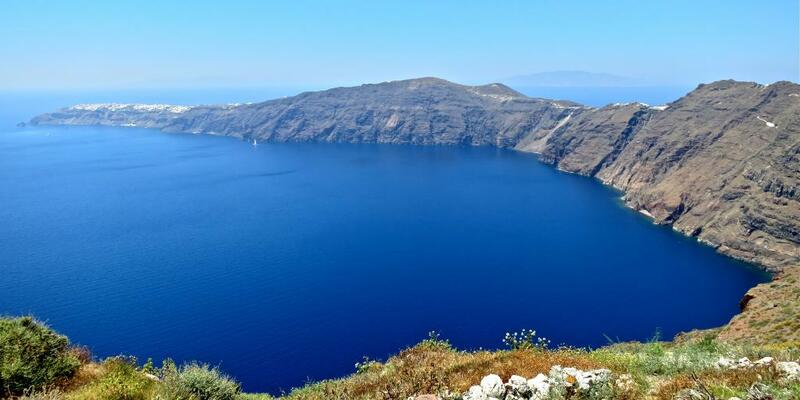 Amoudi Bay is known as one of the most scenic parts of Santorini, with sensational views of the caldera. Once you've reached the waterfront, follow the pathway around the base of the cliff to the swimming area. If you're feeling adventurous, climb to the top of the cliff and dive off into the crystal clear waters. 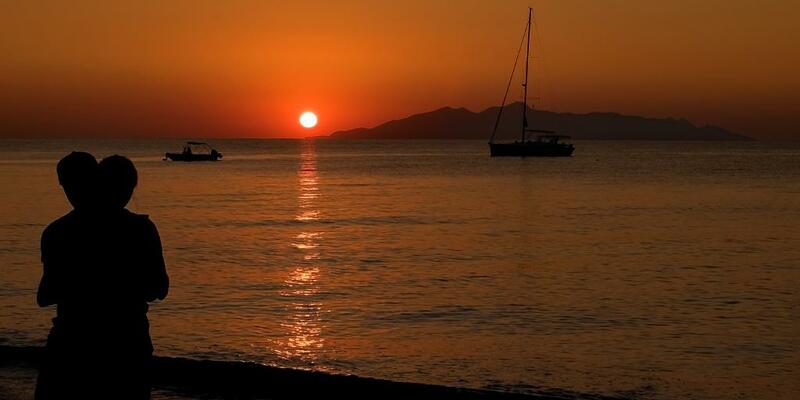 Have a swim around the beautiful Aegean sea before drying off on the rocks in the sunshine. If you're feeling hungry, nab a table at one of the many waterfront restaurants and indulge in some fresher-than-fresh seafood dishes as you watch the colourful boats float by in the harbour. Ammoudi Fish Tavern, Dimitri's and Sunset Taverna are some of the local favourites; you can't go wrong with grilled fish and a bottle of beer or glass of crisp white wine. Top tip: You pay for the fish by weight, so always ask for the price before you order. After lunch, head back uphill to Oia and have a wander around the gift shops and local jewellery shops. While you're at it, peek into the famous and incredibly photogenic Atlantis Books, which has the feel of an old iconic bookshop like Paris's Shakespeare & Co, despite the fact that it was only opened in 2004. 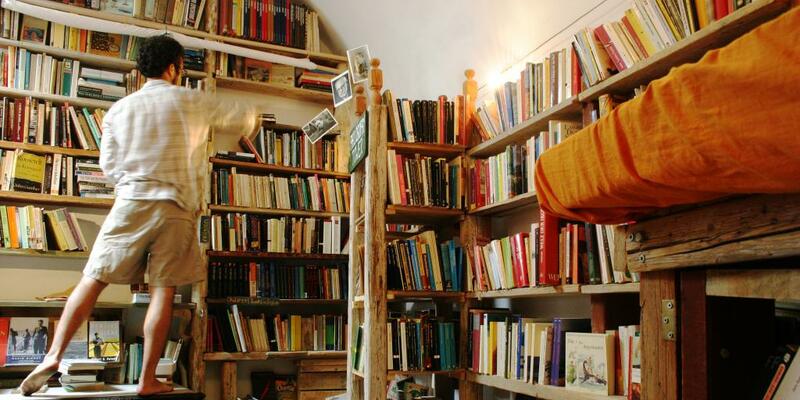 Here you'll find old and new tomes in all different languages, as well as vintage maps and fantastic travel guides. Pick up a few souvenirs from Oia before heading back to your hotel room for a well deserved rest. When it's time for your evening meal, head over to Thira. Set in an old mansion overlooking the caldera, Mezzo Restaurant deserves its reputation as one of the best restaurants in all of Santorini. Not only is the setting absolutely spectacular, with soft romantic lighting and to-die-for sunset views, but the food here is equally superb. Chill out in the morning with a cup of coffee and some Greek yogurt topped with fresh fruit. Then head to your car and navigate to Pyrgos Village. Pyrgos is full to the brim with wonderful nooks and crannies to get lost in, as well as old churches and cafes to discover. 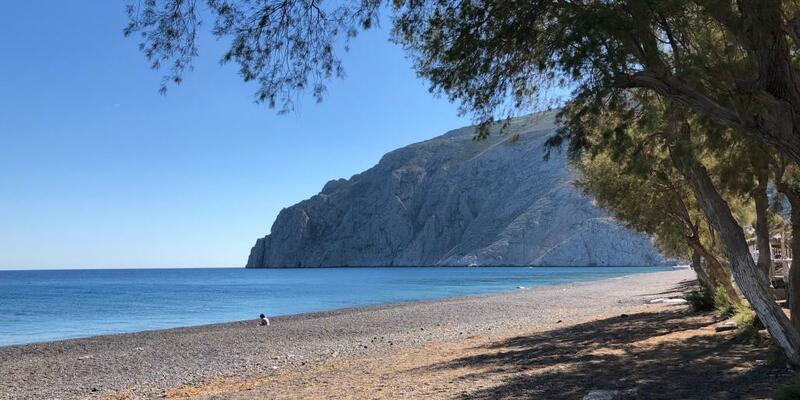 With its peaceful atmosphere and somewhat deserted feel, Pyrgos feels worlds away from the luxury villas and terraced restaurants that occupy the rest of the island. Spend a few hours roaming around the narrow pedestrian streets with your loved one and admiring the unbelievably scenic views. Then pop into a cafe for a strong coffee and a traditional plate of mezze. From here, it's an easy hop, skip and jump to the wineries of Santorini, where you'll be spending the afternoon/evening sampling local wines. There are a few different places to choose from, but we recommend heading to either Hatzidakis Winery (a relatively new one) or the well-established Venetsanos Winery. The former is laid-back, reasonably priced and intimate, with staff who are clearly passionate about wine. Meanwhile, Venetsanos has caldera views and is one of the better known options, for good reason. Both wineries have lovely and knowledgeable staff that are sure to provide a memorable experience! 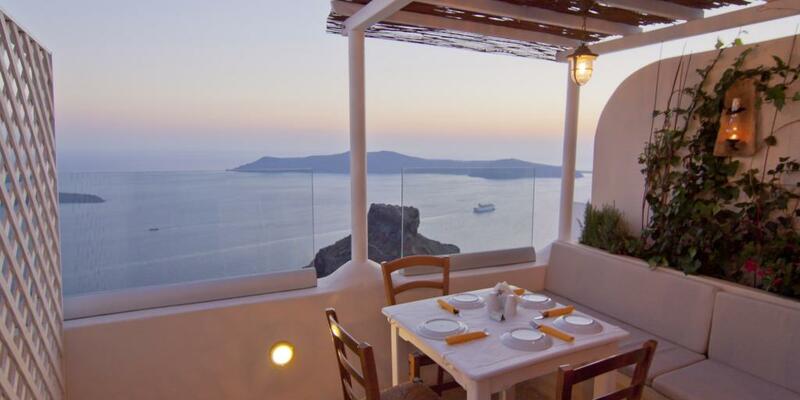 Take a break from your hotel breakfast routine to visit Passagio in Oia, one of the island's favourite cafes. Whether you've got a sweet tooth or prefer something a bit more savoury, the menu here does not disappoint. Fresh juices and tasty smoothies are accompanied by dishes including fluffy pancakes, crispy bacon and rich, creamy Greek yogurt - the real deal, of course. The fantastic sea views from the terrace are simply the cherry on top. After breakfast, walk 15 minutes west along Nik. Nomikou until you reach Caldera Massages Studio. This highly-rated spa specialises in blissful massages for couples, and the experience they provide is truly rejuvenating and romantic. Thought 60 minutes was the maximum massage time? Think again! 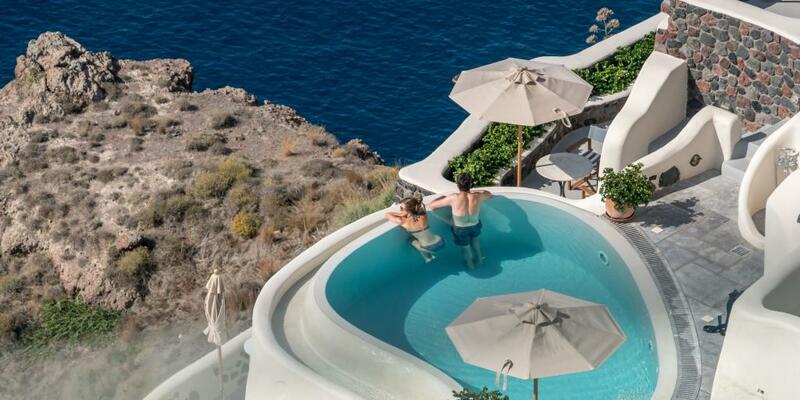 At Caldera, the Couples Santorini Massage lasts for nearly two hours, plenty of time to truly relax and unwind with your loved one. If you feel like a spot of sightseeing after your treatment, the Byzantine Castle Ruins are nearby and worth a visit, if only for the jaw-dropping views you get from there. After a rest and perhaps another plunge into the hotel pool, have a laid-back dinner teamed with a chilled glass of ouzo - Greece's signature liquorice-flavoured drink, then head back to your room to read, relax, and do whatever it is you newlyweds want to do (winky face). By now you've been on land long enough; it's time to take to the high seas. There are a variety of companies that offer different types of boat cruise around the island, from sunset catamarans to all-day excursions on wooden sailboats. You can go for a big tour, a small group or a private luxury cruise all to yourself, and activities range from scuba diving and snorkelling to beach-hopping and volcano-climbing. The choice is up to you! Whatever you decide on, you'll probably want to make a day of it by disembarking in the morning and staying out til dinnertime. After your cruise, enjoy an unpretentious dinner at your hotel or nearby. Roka, set in an old 1912 building in Oia, is a nice choice. Here they serve up traditional dishes like Santorini Salad, skioufikta (homemade pasta) and slow cooked lamb in a peaceful, cosy and casual setting. Another adventure awaits today, this time on land. I know, I know, honeymoons are not for exercising; but trust us - the exhilarating Fira to Oia hike is a Santorini highlight that you really do not want to miss. Starting in Fira in a square beside the Hotel Atlantis, a well-marked 10.5-kilometre-long footpath takes you along the caldera cliff and through the villages of Fira, Firostafani, Imerovigli and Oia, with sensational views all along the way. You can expect quite a few ups and downs, but if you're relatively fit, you shouldn't have any problems doing the one-way walk in about 3 hours (not including stops to take pics! )Treat yourselves to a drink when you reach the end. Depending on how much hiking you want to do, you can also go on a detour to Skaros Rock for even more breathtaking views of the island. Just note that this extra stop will add about an hour to your trip. If you have some energy left after your hike, round out the day with a film at Kamari Open Air Cinema. 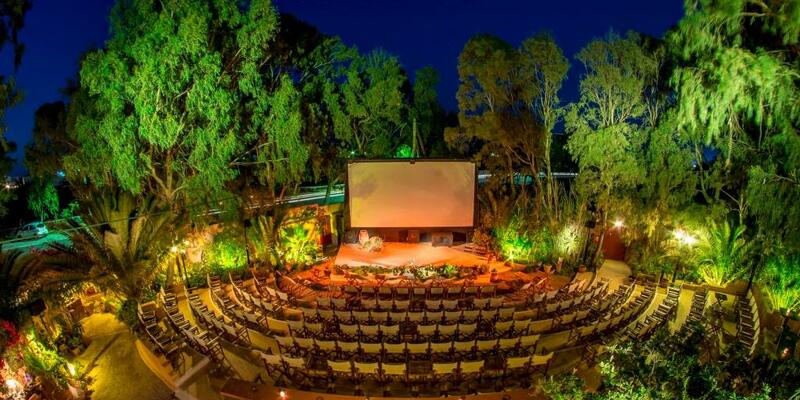 Open from May to October, this incredibly atmospheric outdoor movie theatre shows all the top English films with Greek subtitles. Hunker down in one of the cosy seats with a cocktail, snacks, and a blanket if it's chilly. Tickets are 8 euros each - well worth it for such a unique experience. Top tip: Get to the cinema an hour or so before the film starts to nab seats and take full advantage of the pretty setting. On the last day of your honeymoon, rise and shine before dawn breaks for a chance to watch the sun rise. Santorini may be famous for its sunsets, but it's equally magical to see the white-washed houses take on a magical purple and orange glow in the morning. Plus, at such an early hour it will feel like you have the whole island to yourselves. Find a good vantage point or balcony and soak in the peaceful atmosphere. Spend the rest of the day taking it easy, sampling whatever Greek food you haven't tried yet, and snapping some final pictures to add to your Santorini scrapbook (read: Instagram story). Have one last swim before packing up your things and heading back home. Villa Katikies: Slightly pricier (but for good reason), this small complex of 7 idyllic private villas has stunning views and exceptional service. Again, each one comes with a private Jacuzzi - Santorini really is set up for honeymoons! San Antonio Luxury Hotel - Views of the volcano, a state-of-the-art spa and a top-notch restaurant are some of the perks at San Antonio. Each suite has its own distinct character, with lovely contemporary decor throughout. Senses Boutique - A serene oasis and great value for money. 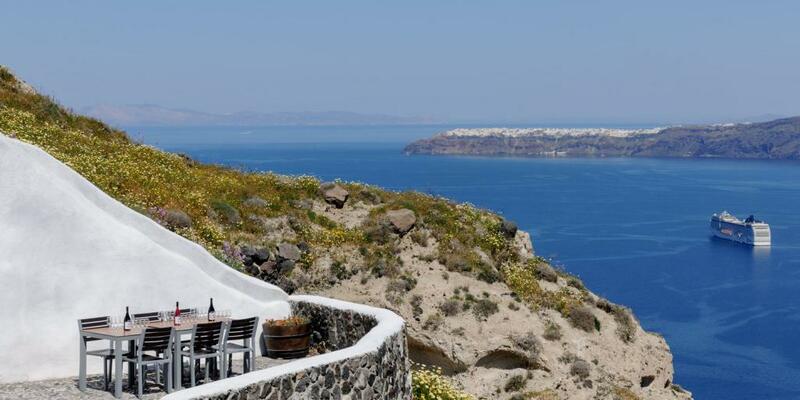 Perched on one of the highest points of the island, the colourful hotel rooms offer glorious views of the caldera. Note: Some of these hotels require you to stay at least 7 nights to qualify for the honeymoon suite. June to September has the nicest weather, but it's also peak season, which means the cost of everything - from hotel rooms to boat tours - tends to go up. 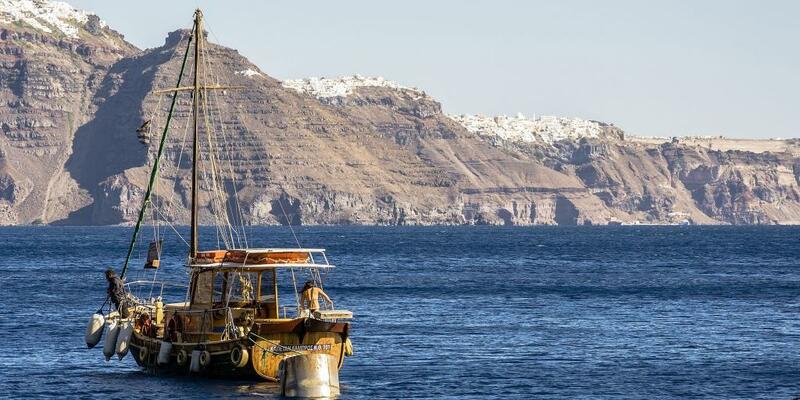 To save a little cash and avoid some of the crowds, plan your trip to Santorini for October or April. The weather will still be warm enough for beach-going, and the cool evenings will be perfect for sitting in that private Jacuzzi with a glass of wine.